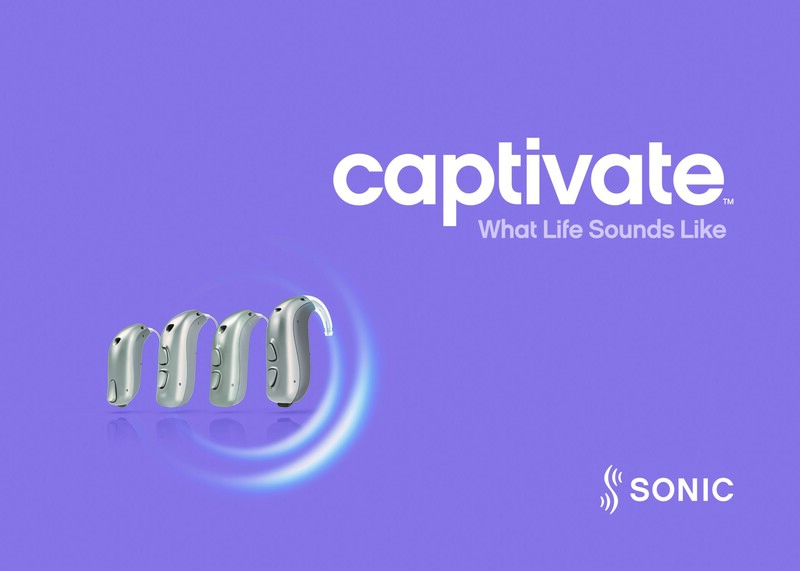 Somerset, NJ March 18– The new CaptivateTM hearing aid family from Sonic delivers on the 4S Foundation of natural sound, speech understanding in noise, simplicity and style to provide a personalized hearing experience with better feedback and background noise control. The advanced processing power of the SoundDNA platform powers innovative new technologies that allow patients to hear their own voices naturally and experience more comfort in noise compared to previous technology. Joining the lineup in May 2019 is a sleek, new miniRITE T R style with a built-in Lithium-ion battery that delivers a full day of power on a single charge, even while streaming TV, music and more. With Captivate, Sonic introduces Adaptive Feedback Canceller Pro, a new technology that minimizes distractions from feedback in both stable and changing conditions and enables more open fittings for a natural, own-voice sound. Two systems working together offer robust feedback cancellation capabilities, especially at higher output levels, compared to previous technology. 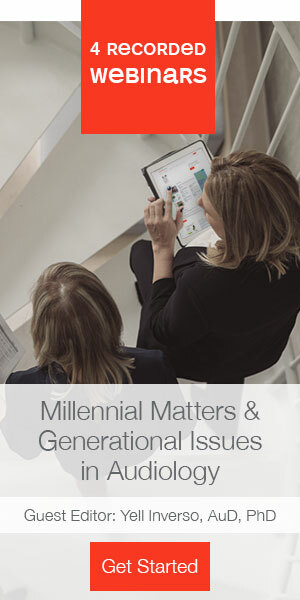 While the standard AFC system continually operates in the background to quickly cancel feedback in static conditions, the speed of the new supplementary system adds up to 6 decibels stable gain to manage sudden, unpredictable changes to the feedback path. Speech in Noise (SPiN) Management, an advanced noise reduction system in Captivate, uses three systems working as one to improve speech understanding in noisy environments – where patients need help the most. SPiN Directionality, a specialized directional microphone system, automatically activates to locate speech in noise, continually adapting between omni- and directional settings as noise moves relative to the listener. SPiN Noise Reduction, a fast-acting, modulation-based algorithm, operates in 16 independent frequency bands, managing noise across the same frequency range as SPiN Directionality. The third system, SPiN Engage, allows you to personalize Captivate according to how much noise patients are willing to accept in their individual listening environments. Options vary by technology level, including a new Very High setting that engages at the onset of soft noise levels while the SNR is still high, an attractive option for patients who are very sensitive to noise. The new Captivate miniRITE T R is Sonic’s newest rechargeable style on the SoundDNA Platform. The slim and discreet solution features a built-in telecoil, dual push button, and integrated Lithium-ion battery (312+ battery size) for all-day power, even when streaming from wireless accessories. With a sleek, minimalist look and easy functionality, the charging unit features contactless, inductive charging to deliver a full 18-plus hours of power with a simple and quick three-hour charge. Added conveniences include a power on/off LED indicator, wall charger and USB 2.0 compliant options for PC, TV, car and power bank. The miniRITE T R is available in Captivate 100|80|60 technology levels and includes the latest features found on the SoundDNA platform. All Captivate technology levels 100|80|60 and styles(miniRITE, miniRITE T with telecoil, miniRITE T R and BTE 105)feature the Dual-Radio System for 2.4 GHz direct audio streaming and fast ear-to-ear communication. Captivate products are Made for iPhone®, and the optional SoundClip-A accessory allows patients to stream sound in stereo to Captivate from Android™ and other Bluetooth® 2.1 smartphones and devices. Additionally, the SoundLink 2 App offers discreet control and the convenience of internet connectivity with the If This Then That (IFTTT) web-based service. For more information on the entire Captivate family, including Captivate100, Captivate80 and Captivate60 and popular styles, visit www.sonici.com. Sonic Innovations, Inc. is a U.S.-based manufacturer of hearing care solutions that envisions a world where all people can enjoy the sounds that enrich everyday life and where lives are improved through enhanced hearing. Since 1998, Sonic employees and distributor partners have provided quality products with a proven benefit track record. Today, Sonic has a global sales network represented in more than 45 countries. Sonic focuses its product development on its 4S Foundation (Sound that’s natural, Speech understanding in noise, Simplicity in everything we do and Style that stands out) to ensure that with Sonic, Everyday Sounds Better. Visit www.sonici.com for more information.